Adjusted suizeguide, this dress runs small according to other SS! dresses. UKTake measurements while wearing the undergarments that will be worn with this dress or gown (and nothing else).Consult the Sizeguide to determine which size you should purchase. BUST: Measure around the fullest part of the bust, keeping your elbows tucked down toward your sides.WAIST: measure across smallest point. Bend to one side to find the natural crease of your waist. HIP: Stand with your feet together, measure around fullest part of your hips and rear Still in doubt? Please do not hesitate to contact us! Limited collection for the very last time exclusively available at TopVintage: The Lara A-line black dress by Stop Staring! You will get soooo much use out of this dress, its perfect, sweet and yet simple! It is made of quality and super stretchy poly bengaline. Stretchy fabric is very flattering on all shapes and sizes. Bodice is fitted with tie neckline. Neckline IS gathered with elastic, and is very accentuating to the neck and bust. Sleeves can be worn slightly off the shoulder. Skirt is A-line and hits the knee depending on your height. 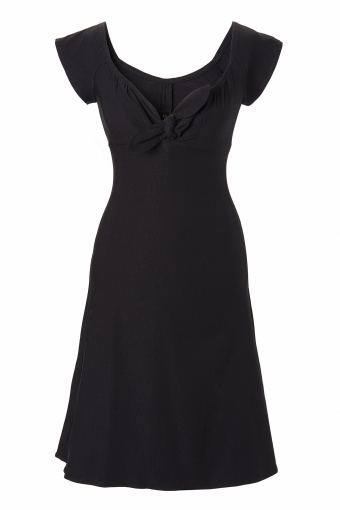 This dress is very adorable and a sure classic for your wardrobe. Staring! is one of the most exclusive retro labels available, be pleasantly surprised by the high quality and great fit! had besteld, maar enorm goed opgelost. En ik ben echt enorm blij met mijn nieuwe jurk!!! Super service!! !